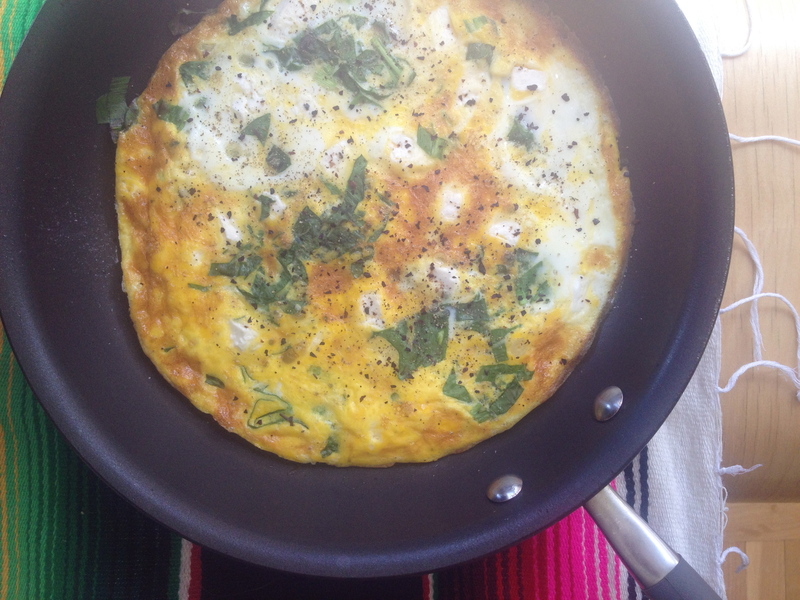 Spring Breakfast with Ramps—yes, please! What better way to celebrate spring than waking up early on a Saturday morning, going to your nearest farmers’ market, and buying up a big bundle of fragrant ramps? I think because of their popularity the price of ramps have gone up since last year. Now, instead of $3 a bunch, which was about 1/4 pound, they are $15 per pound at the Fort Greene farmers’ market. C’est la vie. It’s one of those times I feel a wee bit silly as a New Yorker—paying for over-priced seasonal vegetables at the market, because, well, that’s the only way I can get them. Well, not the only way—last year my friend picked them wild upstate and I made this ramp butter. The year before I gave you a recipe for linguine with ramps. This is the second weekend I’ve bought ramps at the market and I imagine they’ll be around for at least one more week, making it to next weekend’s market for perhaps the last time this year. This year inspired in part by David Tanis’s article in the Times on fried eggs and ramps, I wanted to keep it simple. So last night I made bulgogi with whole sautéed ramps eaten in lettuce leaves with Sriracha and thinly sliced cucumbers. This morning for brunch I made a quick omelette with sautéed ramps, this time chopped up not whole, and a salty sheep’s milk cheese from Turkey (beyaz penir), similar to feta. Use the entire ramp—stem and leaf—just remember to clean the ramps thoroughly and chop off the roots. In a medium bowl, whisk four eggs with the milk. Add a little bit of salt and pepper. Set aside. Heat the olive oil in a small oven-proof skillet. Turn the broiler of your oven on (on low if you have the option). 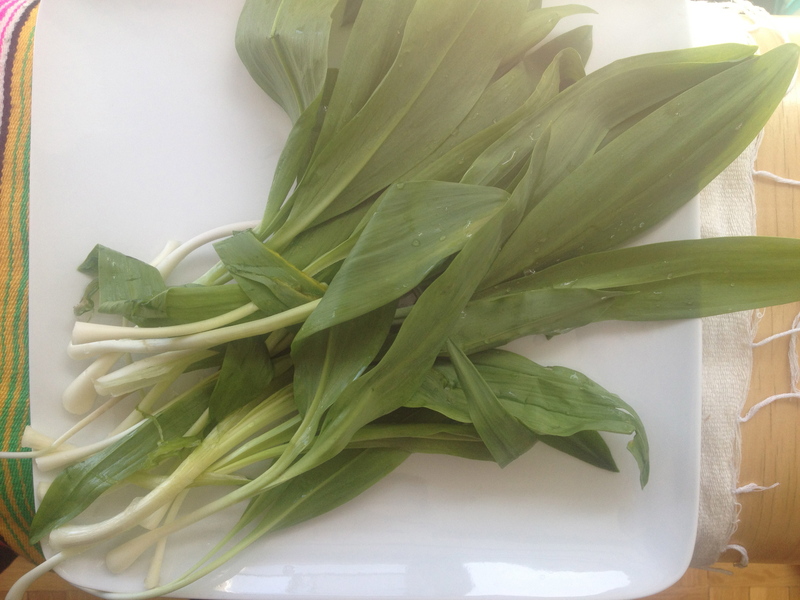 Chop the stems of the ramps into small slices and set aside. Chop the green leafy tops into small ribbons. When the pan is hot toss in the chopped stems of the ramps and lower the heat, sauteéing for one or two minutes. Add the ribbons of leafy greens to the pan, sauté for another minute, then add the eggs. Sprinkle the crumbled cheese on top. Do not stir or scramble, just let the bottom of the eggs cook for about two minutes undisturbed. Transfer the skillet carefully to your oven (or underside of your oven if that’s where your broiler is) and cook the top of the eggs for three to five minutes, until it just starts to brown and puff up. It’s quite a beautiful thing! Serve with spicy Sriracha and sliced cucumbers.